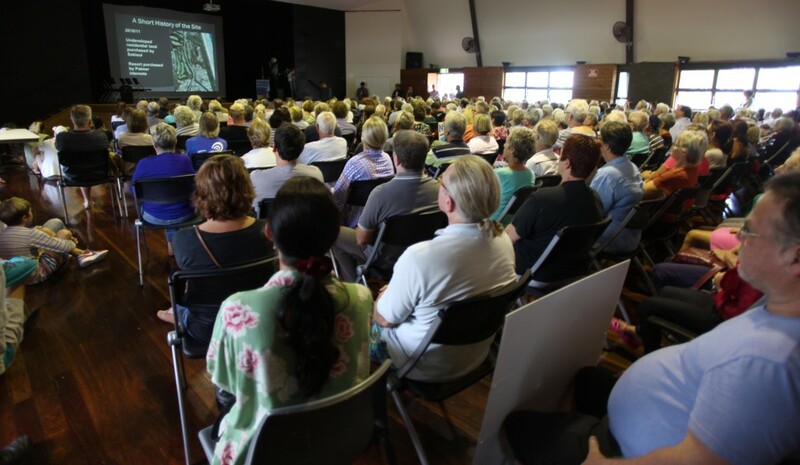 A packed community information forum at Coolum on Saturday voted unanimously to oppose any changes to the Sunshine Coast planning scheme that would allow for Sekisui’s proposal for intensive high rise development at Yaroomba Beach. “The capacity audience of 600 people from across the region is justifiably concerned about this inappropriate proposal for the sensitive beachfront of Yaroomba” said Keryn Jones, President of the Sunshine Coast Environment Council, co-hosts of the event with local community group, Development Watch. The show of opposition backs up independent survey results, thousands of petition signatures and unprecedented volumes of communication with Councillors. “The result was the Town Plan that was adopted in May. Effectively that Plan is a contract between Council and the community so that we know what to expect in the future. It is no surprise that developers will challenge some aspects of the Town Plan, particularly beachside areas, but one of the key purposes of Town Plans is to ensure people are protected from inappropriate development. The Sekisui proposal does not remotely resemble what was determined as appropriate for this area.” she said. Sekisui recently released its’ revised concept plan, showing 17 buildings ranging from 4-10 storeys (approximately 16-40m). The current permissible height is 8.5m across the 22ha site with a small portion at 16m resulting from an earlier approval. Sekisui House had been extended repeated invitations to present its concept plan to the community at the public information session without response until a letter declining the opportunity was received three days before the event. The stretch of beach which would be impacted by any intensive development is critical nesting habitat for threatened turtles. When a resolution for Councillors to vote against any change to the planning scheme that would facilitate Sekisui’s proposal and undermine planning protections for the rest of the region and to have the meeting to consider such amendments open to the public was put to a vote, there was an uninterrupted sea of hands in favour. Council is expected to consider planning scheme amendments at a Special Meeting currently scheduled for 9am on 27 April in Caloundra. “We encourage people to contact the Mayor and their local Councillor to express their views and to attend this pivotal meeting which will test the integrity of the planning scheme and the accountability of this Council.” concluded Mrs Jones.